Difference between revisions of "Rhodes' Raiders"
Photograph of James A. Rhodes of Columbus, Ohio. 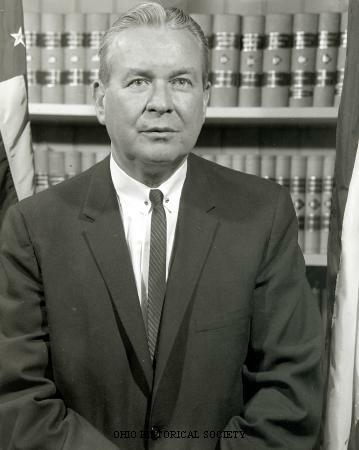 He served four terms as governor of Ohio from 1963 to 1971 and 1975 to 1983. "Rhodes' Raiders" were a group of Ohio's most prominent political and business leaders that Ohio Governor James Rhodes recruited to actively encourage new business development in the state. In 1962, Ohio voters elected Rhodes, a member of the Republican Party, to the governor's office. Upon taking office in 1963, Rhodes inherited a state with a strong economy and booming population, but many political and economic specialists predicted that dire consequences would come to Ohio if job growth did not increase dramatically. To increase employment opportunities in the state, Governor Rhodes created Rhodes' Raiders, a group of Ohio's most prominent political and business leaders, to actively recruit new businesses. Rhodes' Raiders traveled across the United States and the world, seeking new markets for Ohioans' products. They also encouraged businesses, especially manufacturing ones, to relocate to Ohio, touting the state's low tax rates. Members of this group traveled to Asia, Europe, Central America, South America, and Africa, seeking to maintain Ohio's status as an economic leader. When business leaders from other states or countries visited Ohio, Governor Rhodes met personally with them and encouraged them to relocate to the state. He also served them hamburgers, rather than a formal dinner, hoping to show his guests how friendly Ohioans were. Thanks to Governor's Rhodes's efforts, numerous businesses relocated to Ohio. Rhodes's most important accomplishment on this front involved convincing General Motors to relocate part of its production facilities to Lordstown, Ohio, in 1966. With the arrival of this production complex in Mahoning County, Ohio became the second leading car manufacturer in the United States. Despite Rhodes's efforts, Ohio experienced an economic downturn during the 1970s. Industrial workers especially faced high unemployment rates. Numerous businesses moved out of Ohio. Rhodes reestablished his Raiders, but this time the group proved to be much less effective in creating new jobs and markets during the 1970s.